As happens during the last 5 years, the transition from winter to summer was rapid. But this year was very fast. Within the first two weeks of April large amounts of snow disappeared from the mountain, leaving us very little room to live the excitement of the spring conditions. Arriving in the summit of Skourta in a brisk spring morning. 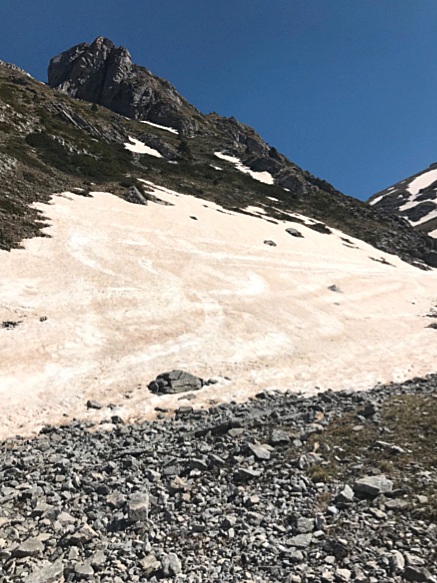 Despite the cold and snowy conditions during the last week of late October, the winter season did not kicked until late December / early January, where considerable amounts of snow fell on Mount Olympus. January and February appeared to be THE months for alpinism and skiing as large spells of stable weather made snow conditions to settle fast and the relatively low temperatures helped the ice to stay on the walls and the powder in the couloirs. A few repetitions of classic routes on the east face of Stefani in early January from the usual suspects from Athens, were followed numerous raids from French, German and Austrian skiers. The couloirs of Mytikas and Stefani with their classic status witnessed many ski descends this winter. Another busy day for the summits. 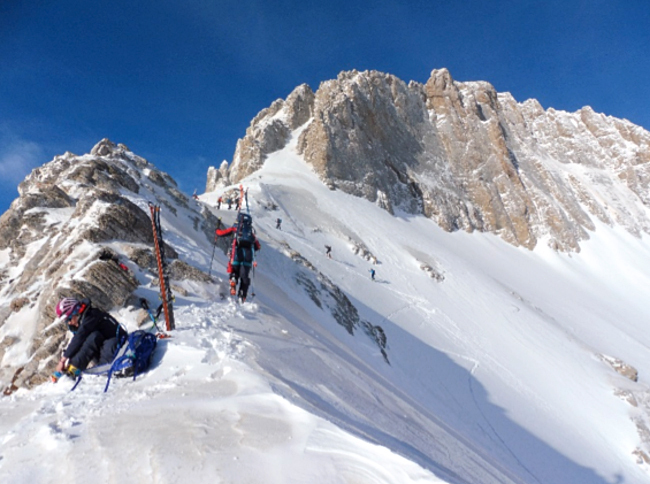 Mytikas and Stefani couloirs witnessed and unprecedented number of skiers this last winter. March, a month usually characterized by lots of snow, was poor in snowfall, but very rich in intense south (Sirocco) winds that for certain days their speed exceeded 100km/h, and by intense transport of Saharan Dust, which gave the white slopes a reddish / orange color. Conditions were difficult and avalanche danger was considerably high for the second half of March. 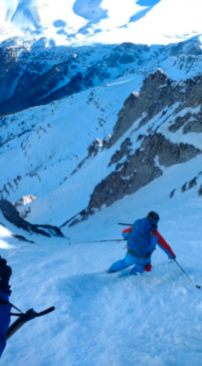 Despite the non-friendly conditions foreign skiers continued to ski on the slopes and the couloirs of the Gods. In early April, snow conditions were still favourable for big ski descends, but an unusual (at least for the standards of the meteorological records) rise in air temperatures with continuous sunshine and atmospheric stability, changed the conditions very fast and left us for another year to dream the big unskied north couloirs. 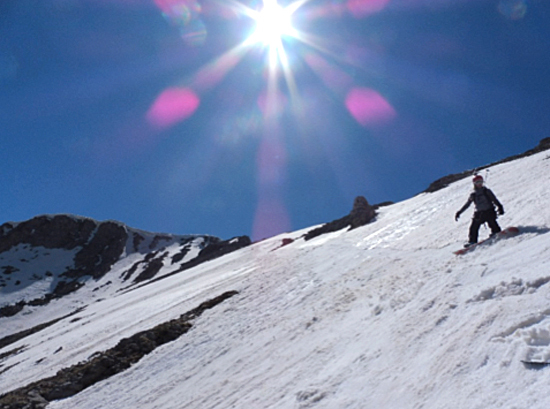 Surfing the mid-April slushy snow from the summit of Skala, under unusually warm and sunny conditions. All in all, a very moderate to poor winter with lots of south winds, intense transport of Sahara Dust and an early arrival of the summer…much earlier than expected. The highlight of the winter season was definitely the arrival of an unusual high number of foreign skiers, a trend that gave us the insight and the drive to publish for the first time a Ski Mountaineering Map for Mount Olympus. You can find the on-line version of the map for free at: https://www.routemaps.gr/en/1st-ski-mountaineering-map-greece/. Your feedback will be highly appreciated, in order to be ready with an improved version next October. The last turns of the season on the Saharan Dust-laden snowpack. By mid-April and after more than 30 continuous days on the mountain, we thought to hit the warm beaches of the Aegean Sea, in order to get a well-deserved rest before the opening of Refuge Christos Kakkalos on May 25th. Best Wishes for the coming summer!